Arapahoe Basin Ski Area will host its third annual climate panel on April 6 at 5 p.m. in the A-Frame building. Titled “The Future of Skiing: The Science Behind the Snow,” the panel features climate research scientists and advocates who are focused on how climate change is affecting winter and the ski industry, especially in Colorado. The panel will be moderated by A-Basin COO Alan Henceroth and is open to the public. Panelists include Elizabeth Maroon, a scientist in the Climate and Global Dynamics Laboratory at the National Center for Atmospheric Research in Boulder; Dr. Noah Molotch, associate professor and director of the Center for Water, Earth Science and Technology at the University of Colorado and a research scientist at the NASA Jet Propulsion Laboratory; Geraldine Link, director of public policy for the National Ski Areas Association; and Torrey Udall, director of development and operations for Protect Our Winters. 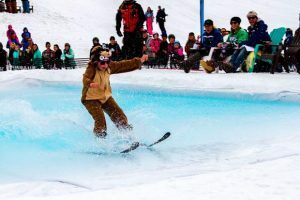 A-Basin is hosting two other events in 2019 focused on sustainability and the environment, including Save Our Snow and Demo Day on March 30 and an Earth Day celebration on April 20. Complete details can be found at ArapahoeBasin.com/events.